Banjar Hot Spring, This hot wellspring source is predictably built since of hundreds of year ago and since the Japanese colonize the Indonesia, this place has developed into three pools to relocate the water for taking a bath. The Japanese had also developed its military officer resort close to this area. Having bathing in the heat water containing the brimstone, it will be able to heal the skin disease. This public bath which is built by Japanese now is exploited by public society. Beside of that, now this place is opened for tourist who can use this bathing place to swim in hot pool and also enjoy the water fall. Enjoying the hot water fall, we can feel like squeezing, especially at pool equipped by the douche with the high about 3,5 meters, so that can make the body refresh and relaxation. Entrance ticket is IDR 5.000 / person. After Banjar Hot Spring, we will drive to Lovina Beach in North of Bali, Singaraja Regency, number two biggest city in Bali. You can look around and reservate a boat for your dolphintrip for tomorrow. After that We look for your accommodation near to lovina. Your accomodation can be Banjar Hill retraite ( near to Lovina, with beautifull view) cost are about +/- 250.000 for 2 persons incl breakfast. Dolphin Tour with Traditional Boat.Wake up early in the morning (5.00 AM), At first light, an armada of boats set sail in search of these playful creatures. It is an incredibly popular event each day and the waters can become very crowded during the busy high season. On rare occasions it is even possible to spot a whale or two. to see the dolphins, this is quite an experience, and one not to be missed. Take a boat out and a dolphin will leap from the waves, to be followed by several more. Get back to hotel around 8.00 AM, breakfast and take shower and get ready to continue the trip. Munduk Water Fall, The Munduk waterfall is situated at an altitude of between 800-900 meters above sea level .This water fall is located in the village Munduk, Banjar District, Buleleng regency. 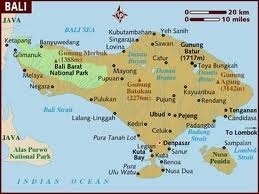 The distance is about 70 kilometers from Denpasar or 20 Kilometers from the tourist area of ??Bedugul. Melanting Waterfall but the people used to call them as Munduk Waterfalls. Munduk waterfall (Munduk waterfall Bali Indonesia), you will encounter the first time when you come from the direction of Denpasar / Bedugul.This Waterfall is 15 meter high and located in the coffee plantation population. From the parking lot, you have to walk as far as 246 yards to reach this waterfall. Splashing water and chirping birds found around waterfalls create an atmosphere of calm and peace, make us feel at home playing Munduk water in this waterfall. Parking Your car in the parking lot on the left side of the road. Next you just walk away as far as 500meters to reach the front of the waterfall. If you bring a bike, you can bring your bike to near the waterfall. Entrance ticket is IDR 5.000 / person. Let’s take a rest on the top of mountain while enjoy the very beautiful view of Lake Tamblingan and Lake Buyan ( Twin lake ) NO Entrance fee. Jatiluwih is a favorite tourist destination in Bali famous with the beautiful rice terraceunfolding from the foot of mountain until the coastal side. It is one of places to visit in Bali with the beautiful view as according to its name from Jati and luwih, where Jati mean really and Luwih meaning especial, good, and beautiful or the equivalent. The local paddies are planted in this place look typically of the high relative size plant if it is compared with other pre-eminent paddy planted by most farmers in Bali . Despitefully, Jatiluwih also famous with its organic agriculture system due to the location is located in the in the plateau of Watukaru Mount which is suitable for the agriculture development. Entrance ticket is IDR 10.000 / person. Tanah Lot temple. One of the most popular tourist destination in Bali. Located at Beraban village, Tabanan regency. The spectacular Tanah Lot is possibly the best known and most photographed temple in all over Bali, especially at sunset time. Tanah Lot means “Land [sic: in the] Sea” in the Balinese language. Located at Beraban village, Tabanan regency, about 20 kilometres (12 mi) from Denpasar, the temple sits on a large offshore rock which has been shaped continuously over the years by the ocean tide. Tanah Lot is claimed to be the work of the 15th-century priest Nirartha. During his travels along the south coast he saw the rock-island’s beautiful setting and rested there. Some fishermen saw him, and bought him gifts. Nirartha then spent the night on the little island. Later he spoke to the fishermen and told them to build a shrine on the rock for he felt it to be a holy place to worship the Balinese sea gods. The Tanah Lot temple was built and has been a part of Balinese mythology for centuries. The temple is one of seven sea temples around the Balinese coast. Each of the sea temples were established within eyesight of the next to form a chain along the south-western coast. However, the temple had significant Hindu influence. At the base of the rocky island, poisonous sea snakes are believed to guard the temple from evil spirits and intruders. A giant snake purportedly protects the temple, which was created from Nirartha’s scarf when he established the island. Entrance ticket is IDR 30.000 rp. After this i bring you home to your destination in Bali. You have two wunderfull days!